The Buddy Ball baseball field in Rochester, New Hampshire. A child, with his buddy, uses the new field. The Rotary Club of Rochester, New Hampshire, inaugurated its Buddy Ball baseball field with an exhibition game in front of a crowd of 300 this past June. A Buddy Ball field is a regulation Little League field specially designed for use by mentally and physically handicapped youth. As a result, the club was recognized with the RI Significant Achievement Award, which is presented to an individual club that has accomplished a major local community service project, one that all club members are involved in bringing to fruition. Rochester’s “Field of Dreams” project was three years in the making, and started with a tragedy. In November 2011, then-club president Howie Seckendorf died. Howie had been a Little League coach, and in his memory, the club decided to build a Buddy Ball field. This was no easy venture. The project cost US$500,000, and although Rochester is an active club, it has no endowment or history of raising six figure sums. But in honor of Seckendorf, the club decided to embark on the project anyway. Soon, the entire Rochester community was involved in the project. Local businesses held fundraisers for Howie’s Field of Dreams; local non-profits voted funding: and individuals provided their time and talent as well as treasure. Some of the gifts were in-kind or at-cost; the dollar amount the club ended up raising was close to $300,000. Slowly, the field took shape. A handicap-accessible field house was raised in the spring of 2012, the rubberized Astroturf was laid in the late summer, and the parking lot – with a quantity of handicap parking spaces – was paved as soon as weather permitted in 2013. 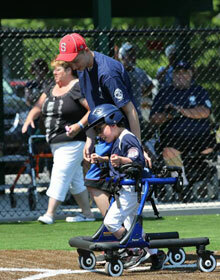 And on the first Saturday morning of June, a sunny, late-spring day, 18 special needs kids lined up to play ball. They may need help from their “buddy” to swing the bat or to run or ride the bases, but on Howie’s Field of Dreams, they no longer have to sit on the sidelines. The Buddy Ball field is completed, but the dream is just beginning. As more children use the field, the club plans to create a league of their own. For now, however, all kids are welcome to play, every Saturday morning during the season. All they have to do is show up, have their parents sign a waiver, and put on a helmet and jersey. The Field of Dreams is theirs to play on. This entry was posted in Building community, Fighting disease and tagged Baseball, Helman, New Hampshire, special needs by Rotary International. Bookmark the permalink.